we are happy to announce upgrade of JBoss Community Search service http://search.jboss.org/. We are starting indexing more community mailing lists, in particular we added CDI, Bean Validation, JBoss Forge, PicketLink, JBoss Developer Framework and JBoss-RPM mail lists. OpenSearch is a collection of technologies that allow publishing of search results in a format suitable for syndication and aggregation. For example many web browsers have built-in support for OpenSearch. Ricardo Martinelli Oliveira approached our team with the idea to implement it for JBoss Community search and he provided first implementation. We took his idea a step further and developed a solid OpenSearch support including extensions like search suggestions and autodiscovery that will make sure it adapts to any changes we make in the underlying implementation going forward (so once you install it, it will not stop working when we rename the URL endpoint). Firefox recognises OpenSearch plugins and gives you a chance to add them into your plugin list with a few clicks. It also supports search suggestions. When you visit search.jboss.org Firefox will recognise OpenSearch plugin and if it hasn't been already installed you can install it by clicking on a magnifier symbol in search field. Then select And JBoss Community. To make use of the plugin place your cursor into the search field, select JBoss Community and start typing. Note that you can get search suggestions at this point. More: Learn to Manage Your Search Engines in Firefox. Google Chrome recognises and adds OpenSearch plugins automatically on the fly. So, as soon as you visit search.jboss.org for the first time, you can easily make use of the plugin. Google Chrome also supports search suggestions. Visit search.jboss.org to make sure the OpenSearch plugin has been installed. To make use of the plugin start typing in the web browser address bar search.jboss.org and at some point the browser will tell you that you can "Press tab to search JBoss Community". Press tab. Now you can insert your query. Note that Google Chrome gives you search suggestions at this point. More: Manage search engines in Google Chrome. Safari browser is one of a few browsers that do not support OpenSearch out of the box. However, there is a nice Safari plugin called OpenSearchForSafari that adds support for it. Then visit search.jboss.org, note that the plugin signals a new OpenSearch plugin has been detected on this page and can be added to the list of your plugins. Just click the icon or use ⌥⌘O (Option-Command-O) and add the "JBoss Community" plugin. 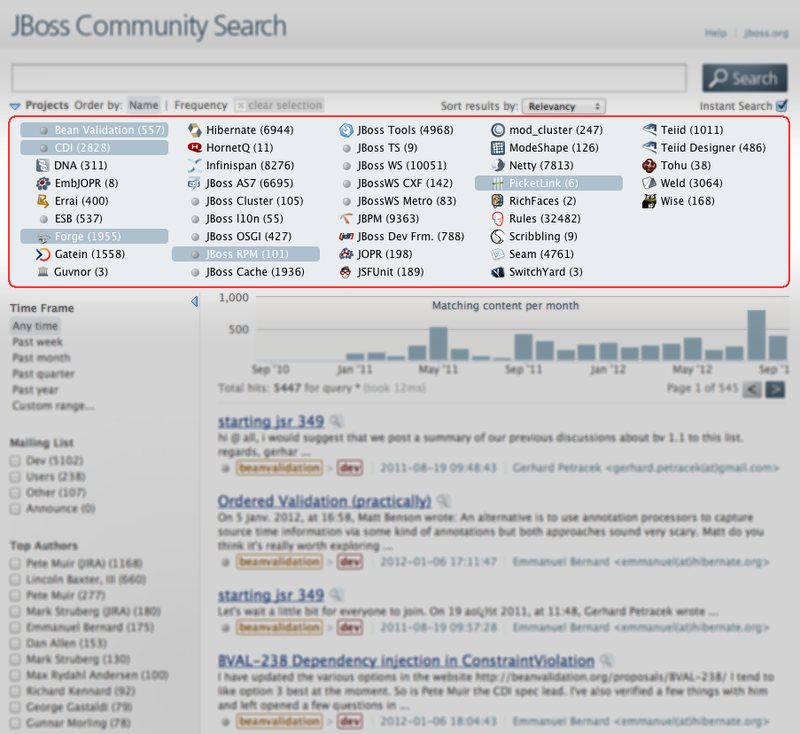 Once you have the plugin added you can search in JBoss Community easily. Unfortunately, the OpenSearchForSafari plugin does not allow for sorting of individual plugins so each time you issue a new search you have to select appropriate plugin from the list. Unfortunately, OpenSearchForSafari does not support search suggestions. http://www.jboss.org uses a plugin, that displas the last tweets from #jbossdeveloper. Very nice and useful plugin. However Jaikirian Pai suggested, that it would be nice, if the displayed Twitter account name was clickable and led to the user's profile. It was good idea. However it took some time to find out how to do that. Twitter has some documentation, but the features they describe do not include this (well at least it is well hidden and so I was unable to find it there). It is really just that easy, if you know the link. And how to get the account number? Well there are many ways. If you are in Java, twitter4j can be pretty handy. But this is another story, that depends on what you have at your disposal. Or if you just want yours, you can use this web page http://www.idfromuser.com. Remember to use @ before your name. http://www.jboss.org runs mainly on Magnolia CMS. It is a web application, that runs on JBoss application server. Eng-ops (= the team responsible for maintaining infrastructure) reported, that logging does not work properly (the bug), because the logs are larger and larger and they are becomming huge. Jozef, the former colleague of mine, updated the configuration of the application server. We use log4j so the whole thing did not appear to be complicated. But the reality is sometimes quite interesting and so this issue remained unsolved for quite a long time. 2012-08-31 11:19:35,610 INFO [com.arjuna.ats.jbossatx.jta.TransactionManagerService] JBossTS Transaction Service (JTA version) - JBoss Inc. So no roll over at all. What could possibly be wrong? Why on one machine it does work and on the other does not? A different version of log4j? Perhaps. A different locale and thus date-time format? Also possible. Thanks God log4j is the open source and thus the source code is available for everyone. I.e. here. If you check the code, you can find, that the content of the log is irrelevant. The only thing that matters is the modification date and time of the log file. It still does not answer why the roll over does not happen. $SU $JBOSSUS -s /bin/sh -c "touch /var/log/$NAME/$JBOSSCONF/$logfile >/dev/null 2>&1"
echo -n -e "\nLogfile /var/log/$NAME/$JBOSSCONF/$logfile exists but not writable by $JBOSSUS." echo -n -e "\nLogfile /var/log/$NAME/$JBOSSCONF/$logfile exists but not writable." And this is it. Touch changes the time, whe the server starts. And because there are logs to be written just when the application server starts, the date of the log file is always the current date and the roll over never happen.